Google takes PC software fight to Mircrosoft's Windows !! GOOGLE has made its most direct challenge to Microsoft with the launch of its new operating system that aims to defeat Windows. It is a battle for the future of personal computing. Users of computers running Chrome OS will be able to get online much more quickly as the system will turn on instantly and automatically log on to the web within seconds. In the first public demonstration of the software in San Francisco, Google showed that a user can be surfing the net within 60 seconds of switching on their computer. Chrome also brings users a step closer to being able to store all photographs, music and emails online rather than on a hard drive. The files would be kept in the "cloud" on the internet and be accessed from any device with an internet connection. Eric Schmidt, Google chief executive, said: "Cloud computing will define computing as we know it." The first computers running Chrome OS will be made by Acer and Samsung and go on sale in the middle of next year - more than six months behind schedule. Other manufacturers are expected to release devices running the software soon afterwards. Google also announced a pilot program inviting business and personal users to test the new system and said it would send free computers to the first volunteers, starting with those in the US. Google aims to install the system initially on netbooks - small, cheap computers that are outselling more powerful laptops and desktop models - but it believes that Chrome would also be used eventually on those as well. Some commentators argued that Google may have missed its moment, since tablet devices such as the iPad are gaining popularity over netbooks. There are suggestions that the second version of the iPad will begin shipping from China by February. Cloud computing changes the focus of operating systems from controlling desktop PCs to smaller, slimline computers that access the internet swiftly. Google has been frustrated in its attempts to turn its vision into reality by what it perceives to be the limitations of Microsoft's Windows software, which has not been designed with cloud computing in mind. Sundar Pichai, the head of Google's Chrome project, said: "People on their computers live on their browsers within the web. But if you look at computers today...they have nothing to do with the browser or the web. Most personal computers were designed before the web existed." The launch will intensify the rivalry between Google and Microsoft, whose Windows operating system is used on 90 per cent of PCs. Windows continues to be a major source of revenue for Microsoft, alongside sales to businesses of its Office suite of programmes that includes Excel and Outlook. Microsoft has sold about 175 million copies of Windows 7, the latest version of the program. Revenue from Microsoft's Windows division in 2009-2010 was dollars 18.5 billion - up 23 per cent on the previous 12 months. 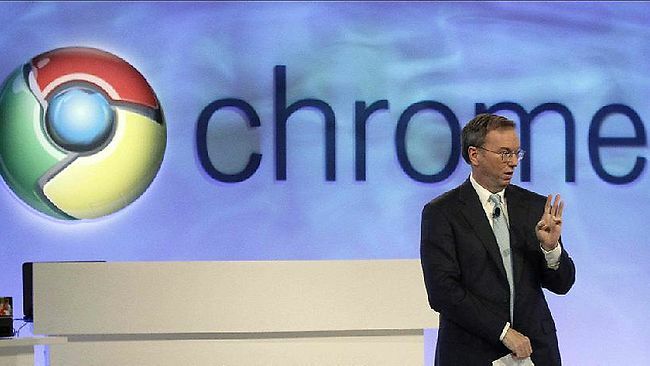 Chrome is Google's latest foray into Microsoft's territory. First it launched a web browser, also called Chrome, to take on Internet Explorer. That was followed by Android, an operating system for mobile phones and tablet computers. This has overtaken Microsoft's Windows Mobile for smartphones. Google also launched a new store for applications for its Chrome web browser. Offers include reading and shopping apps by Amazon and games from Electronic Arts.